KETCHUM — Start your gallery walk at the Sun Valley Center for the Arts. Locals and visitors can take in thought-provoking exhibitions, enjoy wine and mingle with friends from 5 to 7 p.m. Friday at 191 Fifth St. E. You might even meet the artists. The event is free. It’s all part of the center’s Big Idea project, “At the Table: Kitchen as Home,” which examines the central role of the kitchen in shaping our memories, our families and our social lives. Kitchens are places of private ritual — spaces for the preparation of food as well as its sharing. 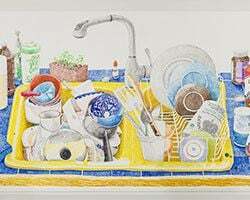 Explore how the kitchen defines our memories of home at this exhibition.